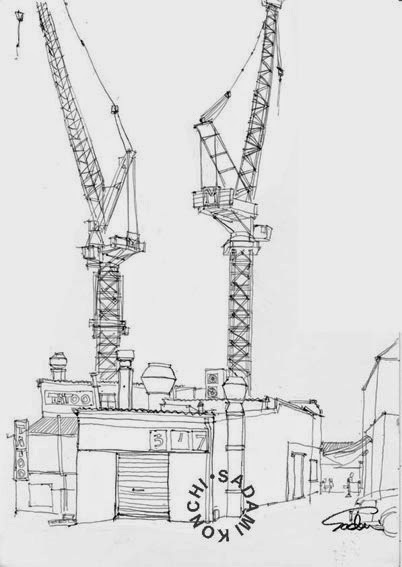 Hi, Friends, I'm sketching architectures to show changing Parramatta in both black and white and colours. The development plan will transform Parramatta into Australia's great city in commercial, cultural, medical and social phases. You can check the info here, "Parramatta Major Development." Parramatta interests me by her strong contrasts : historical vs modern, chaotic vs neat, back streets vs promenades. European settlers marked a first step on Parramatta. Already, this city has become the CBD that has collected Departments of NSW State Government, Court etc as well as City in Sydney ( = Gov Depts often have dual addresses equally in City and Parramatta). The function of Parramatta is increasing. A restaurant on Church St called "Eat Street"
In order to enhance Parramatta's function and upgrade the quality of life, reconstruction and refurbishment has started. In the very near future, sky high towers will stand in Parramatta : Western Sydney University, Cumberland Newspaper/News Ltd Site (Media Centre), Westmead Medical Research Hub, a shopping centre etc, etc. The new huge car parks are ongoing that I sketched. Also, Parramatta CBD is culturally rich to have over 180 restaurants, cafes, eateries and bars that have the most exotic cuisines from around the world. Especially, Church St is called "Eat street." It has many yummy restaurants on both sides. I sketched the Italian restaurant from the opposite side, near to a traffic light (the second image). Thank you for the ice cream shop staff. They respected me and turned a blind eye for my sketching...and gave me "Wow!" Unlike my figures with graphite, my architecture takes time. It's not a loose style. Regarding colours, I'm playing with them, whilst sticking to reality at the moment. I want more time to explore my own watercolour style in architecture. My current figurative drawing and loose painting has taken years to develop from a traditional classic style. Or I may stay with this accurate drawing in architecture? So far, I feel comfortable and it's fun. See how it goes. Back to the topic. Parramatta is going to be the great city. I want to explore this city more. Dynamically and dramatically, Parramatta is dressing up herself! I look forward to what sort of lady will come up. Btw, often my sketching puzzles people walking by on streets. They talk to me, "You're drawing!" with surprise. 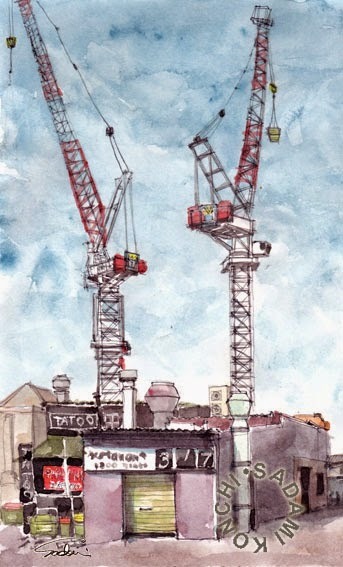 Maybe, my drawing is mismatching to a restaurant or a car park or a construction site?! I believe an artist is a person who has the eye to discover the beauty in ordinary objects. An object will turn to be a subject and begin to shine. We, artists pick up a gem from mud. Did you enjoy my architecture? Any feedback is welcome. 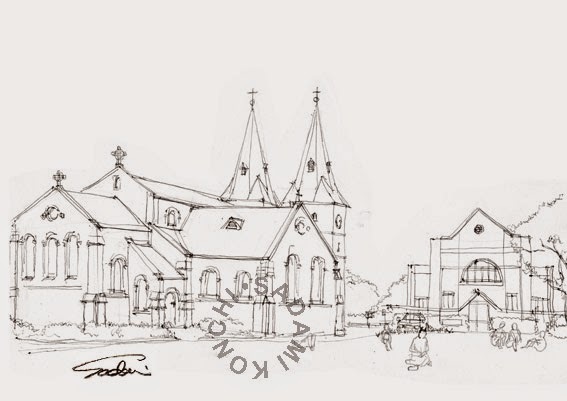 If you like, I'll post architectural drawings more, picking up an interesting topic from time to time. 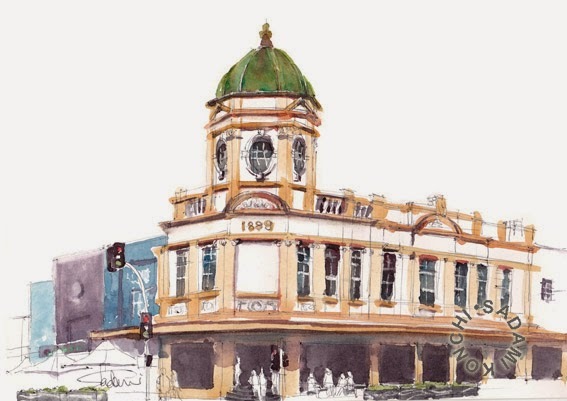 Local shops and Parramatta Heritage Centre welcome my sketching. Passer-bys cheer me up. They are very nice and supportive ʚ(ˆ◡ˆ)ɞ. Thank you!! Btw, some Friends may say, "Hey, Sadami, you've hated architecture?" 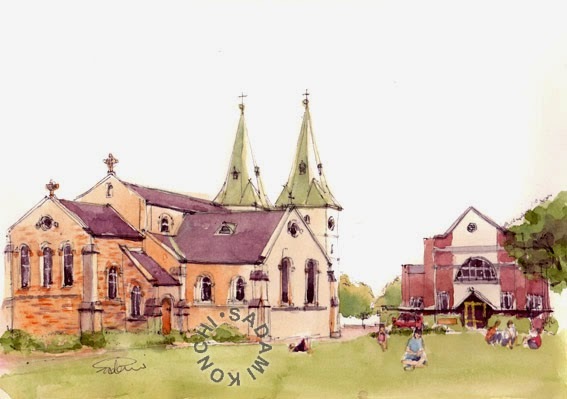 Well, here's a bit funny story how I cured the dislike with these architectural paintings between editor Helen Chamberlin, Australian celebration and me and my tips how to sketch architecture. 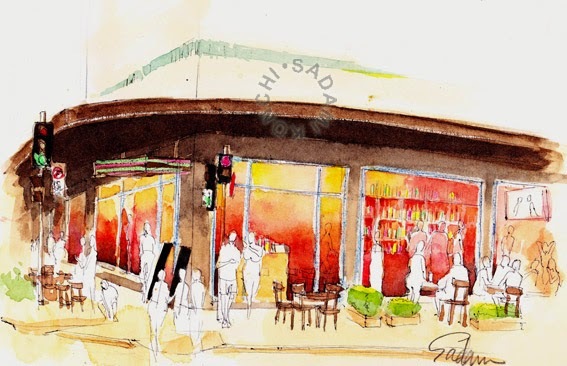 If you like to read on it, come over my blog post, "My dislike of architecture cured by Parramatta sketches" at "Sadami's Graffiti". Parramatta Council (2015) "Building Australia's Next Great City-- Changes Ahead,"
Parramatta Council (2014) "Parramatta Major Development"